What can you learn from watching History’s “Ancient Aliens”? I often wondered about this very question while watching this show (before I gave up watching because it almost gave me a stroke to watch it). I decided to assign my students in World Civilizations 1 a homework assignment revolving around this very question. 1. Choose three claims or ideas that are presented in the show. 2. Using critical thinking and deductive reasoning, and some research if needed, come up with an explanation for these claims using historical sources and what you have learned in class or from the book about ancient civilizations. CITE YOUR SOURCES! 3. What things did we talk about in class that are also discussed in this show? 4. Do you think this show fairly represents history? 5. Why do you think the history channel would show this? 6. Is this a show about history? 7. Who are the “experts” that present the evidence, and what are their backgrounds? 8. What are alternate explanations to theories presented in this show? I hoped that this would help spark some ideas about questioning sources, thinking both critically and historically, and questioning bias and motives that are always present in historians and all people. I was pleased to get plenty of well thought out and reasoned papers! – Maybe the “radioactive bones” at Mohenjo-Daro were exposed to the sun for a prolonged period of time. – Even if there are aliens, why do we give them credit for everything? – We can’t assume aliens exist from something like a cave drawing that is similar to another one on the other side of the world. – Aliens didn’t build massive structures for us – today we are too lazy to imagine something like that being possible. Instead the ingenuity of ancient man isn’t given enough credit. – The show is just an opinionated crazy idea that the History Channel shows to make money and get more viewers. – More time is spent on the ancient astronaut theorists’ ideas than those with historical research backgrounds – this shows an obvious bias. – People looking for alien evidence are not objective and are just trying to find the most simple explanation without using their brains. – Why is it so hard for us to give ancient ancestors credit for what they accomplished? This insults those ancient people and also people today. Today we had a follow-up discussion about the assignment, and we talked about what they got out of the assignment and I also shared with them what I hoped they learned. Additionally, we discussed the idealization in art that is sometimes used. Almost everyone recognizes the golden mummy mask of Tutankamun, but did he really look like? He certainly wasn’t gold, and his features are more of a uniform look used to show Egyptian Pharaohs throughout much of the New Kingdom. In reality, his mummy shows that he had protruding teeth, a slight cleft palate, and a slightly elongated skull. Perhaps most importantly we discussed the idea of questioning sources and biases. 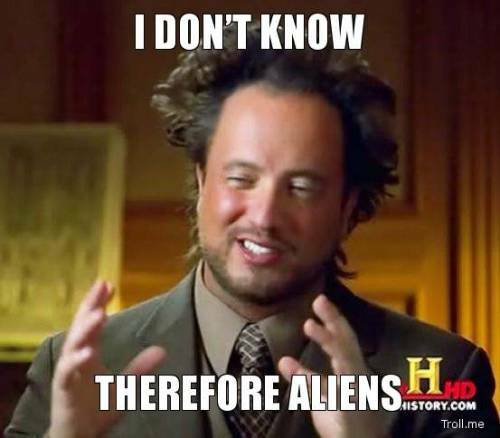 Throughout Ancient Aliens many “experts” are interviewed. The name card graphic tells their name and part of their credentials, such as author or Ph.D. Some of my students went the extra mile to actually look up these people, their curriculum vitaes, and their personal websites (without using Wikipedia!!!). Most pleasing to me was the student who looked up Giorgio Tsoukalos (http://legendarytimes.com/giorgio ). This website claims that he is the world’s leading Ancient Astronaut theory expert. Exactly what does this mean? Wouldn’t you think that someone who makes a living talking about ANCIENT history would have at least a minimal background in history to have the proper context to discuss this? One would think. Tsoukalos DOES have a college degree – in Sports Management. His website also explains, “Until 2005, Tsoukalos also functioned as a professional bodybuilding promoter; for 6 consecutive years he promoted, produced and directed the IFBB San Francisco Pro Grand Prix, an annual cornerstone event in professional bodybuilding.” Additionally, “Giorgio enjoys a good and relaxed sit-down meal with friends, weight lifting, listening to motion picture scores, classic jazz standards, classical opera, sailing, going to the beach and the movies, and hanging out at the Legendary Times Clubhouse in Southern California” and “ 2 more things: (1) Giorgio loves listening to talk radio. Both at home, the office and in his car. Please don’t ask him to turn it off. Ever. (2) Giorgio loves to sit front and center at the movie theater (5th or 6th row). Movies are meant to be seen like this, that’s why they are shown on the silver screen first. If you want to sit in the back of the movie theater, go right ahead, but you’ll both watch the movie alone cuz’ he won’t join you in the back, and you might as well just wait until the movie comes out on DVD so you can watch it on TV.” No further comment needed. Additionally, a student astutely pointed out that this show DOES have some historians that appear – to give historical context and explain various stories and historical happenings. The way this show is edited almost makes it seem that those actual historians agree with the “ancient astronaut theorists.” Whether or not they DO agree is never addressed, but tricky editing gives that appearance. Everyone should understand: you don’t have to have a PhD to be an expert. Conversely, having a PhD doesn’t necessarily make you an expert. Is a person with a PhD in 19th century American Literature necessarily an expert on chemical reactions? OBVIOUSLY aliens are the explanation. Another great product of this assignment was that I got my students to think critically. Rather than just saying, “I don’t know – therefore, aliens” they started to think back to lecture and things they have read in their books to come up with other explanations than just aliens. They also did some outside research to find out what historians think about such “mysterious” things as the building pyramids or moving huge stones for monuments. I was pleased that many of my students were highly offended by the show’s idea that ancestors were too stupid or incapable of doing great things. My lectures and enthusiasm for ancient and classical peoples and their abilities seems to have rubbed off on them. Rather than giving credit to outside extraterrestrials, my students gave explanations that included our ancestor’s ingenuity and ability. Lastly, we discussed the dangers of talking in absolutes. Many times the “experts” say words like “obviously” or “of course” without hard evidence. Even historians may not have the absolute facts or evidence, but many times they say “possibly” or “maybe” – not fact – in those situations. We may not know either way, but using absolutes can lead to the wrong impression. Several people have alerted me to the South Park episode about the History Channel. It is available to watch online at: http://www.tv-links.eu/tv-shows/South-Park_8958/season_15/episode_13/. The synopsis is: “After watching a Thanksgiving special on The History Channel, the boys believe that aliens were involved in the original feast. But, questions remain… was the first Thanksgiving haunted? Is alien technology responsible for stuffing? The truth could change Thanksgiving for everyone.” I personally can’t wait to watch it, and I’m glad the show’s creators are tackling this issue as well, on a level that many people may understand. Have you seen this episode? If so, what did you think? Whether or not you believe in aliens is beside the point. Why can’t we give ancient people credit for the things they did? Now you, the reader. I would love for you to try this assignment yourself! I want to get more feedback from people about this show, sources, “experts”, etc. Have you done a similar assignment in your classroom? What do YOU think about the show? As an archaeologist this show presses my buttons. I will admit that yes, some of the things they claim are true. However the assumption that anything “advanced” is automatically attributed to extraterrestrial involvement. If you compare to what humanity is capable today, especially regarding technology, in such a short time span… who is to say we were not capable of the achievements? Apparently the bright individuals History Channel exposes to the public… absurd. I actually wrote a post related to this not too long ago when talking about multimedia. Thank you for your comments!! It’s good to hear from an archaeologist on this topic. Enjoyed looking at your blog, as well.